The caffeine amount of coffee beans can vary depending on bean size and how darkly they were roasted. This amount is the average caffeine content of an average size arabica bean which is the most common coffee bean used in making coffee or chocolate covered coffee beans. In general arabica coffee beans are listed as 1.1% to 1.4% caffeine per bean, but this isn't a true picture of all of the caffeine they contain. 1.1% to 1.4% represents the amount in the first water extraction of a coffee bean which would be a bout 1-2 mg depending on the exact size of the bean. However, there is still caffeine present in a coffee bean after the first extraction. See our used coffee grounds entry. 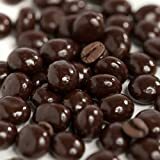 Anyone that as ever consumed chocolate covered espresso beans can attest that they pack a much bigger punch of caffeine than 1-2 mg per bean. 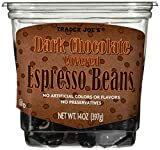 Luckily one manufacturer (Crackheads) had their chocolate covered coffee beans tested for total caffeine and found that they were about 7 mg per bean including the chocolate. So, minus about 1 mg for the chocolate amount, we can estimate the actual caffeine in a coffee bean at 6 mg. When grinding coffee beans for use in making coffee, different brewing methods will have different caffeine extraction amounts. Robusta Beans will have more caffeine than arabica beans and it is generally accepted that they contain double the caffeine of arabica beans. Therefore each robusta bean could contain around 10 mg of caffeine. However, Good quality robusta beans are difficult to find.